Boreham House01323 833719work Bed & BreakfastBoreham House is a beautiful Grade II listed Georgian house set in 2.5 acres with a formal, walled garden, woodland and a field. The three guest rooms are tastefully decorated and furnished to a high standard. The beds all have Vi-Spring mattresses, finest Egyptian linen, large flat screen SMART Tvs and lovely bathrooms with walk-in showers (two rooms have baths as well). Guests have use of the snug, and are welcome to enjoy the gardens and grounds. There is free WiFi throughout the house. There is an award winning breakfast to look forward to every morning with fresh, local produce on offer. 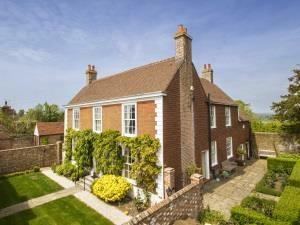 There is also a self-catering cottage in what was the Stables at Boreham House. The cottage has two bedrooms and a lovely patio overlooking the countryside. Boreham House is a beautiful Grade II listed Georgian house set in 2.5 acres with a formal, walled garden, woodland and a field. Boreham House is ideally situated to enjoy all this area has to offer with access to many historical sites such as Battle Abbey and all things ‘1066’ (including the walk from Pevensey to Rye, which passes right by the front door!). Herstmonceux, Pevensey and Bodiam castles are all within easy distance. The gardens of Sissinghurst, Great Dixter and Pashley Manor and the towns of Hastings, Bexhill, Eastbourne, Tunbridge Wells and Brighton can all be incorporated in a day trip from Boreham House. There are many excellent pubs and restaurants in the area with the Bull’s Head being just a short walk away.